Argentina's flamboyant ex-president Carlos Menem says next month's run-off presidential election will be a formality and that his victory is guaranteed. Mr Menem won the most votes in Sunday's first round, but not enough to avoid a run-off. He will face provincial governor Nestor Kirchner in the ballot on 18 May. With almost all votes counted, Mr Menem won 24.3%, while Mr Kirchner had 22%. Sunday's election was the first time the country's 25.5 million eligible voters had the chance to go to the polls since the collapse of Argentina's economy in 2001. Polls were busy as voting is mandatory. Mr Menem - flanked by his wife, former beauty queen Cecilia Bolocco - showed characteristic self-confidence as the results came in, while his Peronist party rival focused on the choice he said voters would face in the second round. "It should be clear that there are two economic models here: One that drove Argentina into debt and one that restores jobs and dignity," said Mr Kirchner, who is considered a much more sober figure. Despite Mr Kirchner's rhetoric, correspondents say the second round will be much more about personalities than policies. The BBC's Peter Greste in Buenos Aires says it will essentially be a referendum on whether Mr Menem should be allowed a third term after governing throughout the 1990s. He is a divisive figure. Almost 60% of Argentines say they would not vote for him under any circumstances, our correspondent says. More than half the country is now living in poverty and one in five workers is unemployed. After casting his ballot Mr Menem declared he would win outright on the first round. 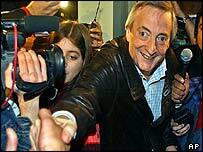 The incumbent President Eduardo Duhalde's favourite, Mr Kirchner, by comparison, is "incredibly grey", our correspondent says - although he is almost 20 years younger, 53 years old to Mr Menem's 72. The new president will serve a four-year term and succeed interim Mr Duhalde, who took office last year after street protests unseated four presidents in two weeks. Many Argentines hold Mr Menem and other leading political figures responsible for the country's economic downturn. Mr Menem has promised to repay the country's vast debts at whatever cost and accept the IMF's medicine. Those promises make him popular among the business community. But economic policy has not been a major feature of election campaigns - even though the financial crisis might have been the reason why the poll was called early in the first place. Most of the debate has been about who has the strength of character, the political clout and the personal power to lead Argentina out of the mess. Although people might not love Mr Menem, they believe strength is one thing he has in abundance, our correspondent says. Mr Menem maintained a slight lead in opinion polls prior to election day, but is much more generally disliked than any other candidate. That has led pollsters to suggest Mr Menem could lose by a wide margin in the second round despite taking the largest number of votes in the first, as anti-Menem voters unite against him. Mr Menem has run a nostalgic election campaign focusing on his time as president in the 1990s, but avoiding mentions of his more unpopular policies and allegations of widespread corruption. "Kirchner will benefit from anti-Menem votes"